Abstract artist Eoin masterfully merges the tactility of paint with the raw form of the brush stroke and injects them into the natural and urban environment as if they had always been there. 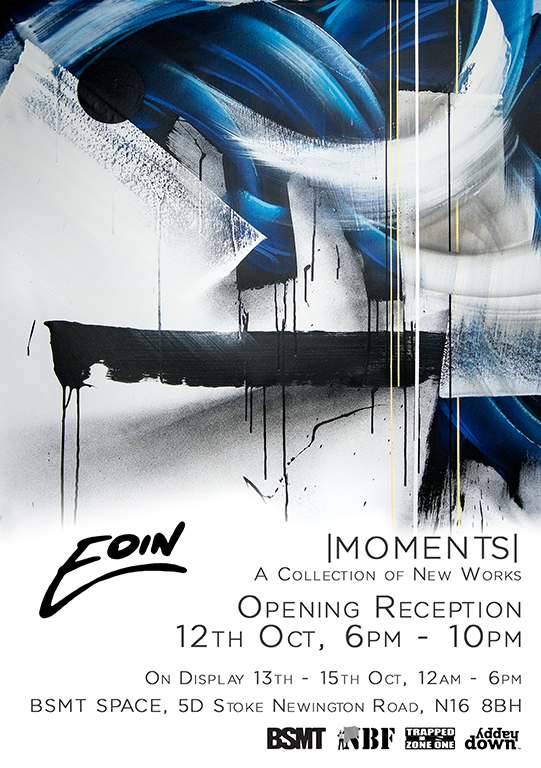 'Moments' will be showcasing these techniques through an accomplished series of canvas originals, the scale and texture of the work becoming all-consuming within the basement environment of Dalston's Urban Art gallery BSMT SPACE. With a career born out of graffiti in the mid 90's, Eoin's move to painting outdoors again in recent years was a natural progression which resulted in him restlessly painting hundreds of murals around the world, engaging communities, organisations, and individuals across continents and countries. This period was crucial to his development as an artist, seeing him burst through the restraints imposed on him by the canvas. He found freedom in painting outdoors and explored exterior surfaces with vigour. More recently Eoin has returned comfortably to the studio, shifting his focus back to developing, understanding and producing his canvas work again. This collection of works has been created out of his studio on the West Coast of Ireland during the months leading up to October 2017. With this new body of work, the artist focuses largely on attempting to capture a moment of identity through organic movement, natural form and inner light. The electricity of London's streets in contrast with the sublime scenic landscapes of the West of Ireland inspire movement, compositions and environments, to engage with and draw in the viewer. 'Moments' will open at 6pm on October 2nd for an exclusive four-day run only. To join us at the opening reception RSVP: info@bsmt.co.uk. With thanks to Happy Down for coming on board as the sponsor for this event.